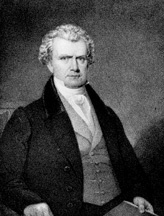 GRUNDY, Felix, a Representative and a Senator from Tennessee; born in Berkeley County, Va., on September 11, 1777; moved with his parents to Brownsville, Pa., and in 1780 to Kentucky; instructed at home and at the Bardstown Academy, Bardstown, Ky.; studied law; admitted to the bar and commenced practice in Bardstown, Ky., in 1797; member of the Kentucky constitutional convention in 1799; member, State house of representatives 1800-1805; chosen judge of the supreme court of Kentucky in 1806, and, in 1807, made chief justice, which office he soon resigned; moved to Nashville, Tenn., in 1807 and resumed the practice of law; elected as a Democratic Republican to the Twelfth and Thirteenth Congresses and served from March 4, 1811, until his resignation in 1814; member, Tennessee House of Representatives 1819-1825; in 1820 helped effect an amicable adjustment of the State line between Tennessee and Kentucky; elected as a Jacksonian in 1829 to the United States Senate to fill the vacancy in the term ending March 4, 1833, caused by the resignation of John H. Eaton; reelected in 1833 as a Democrat and served from October 19, 1829, to July 4, 1838, when he resigned to accept a Cabinet position; chairman, Committee on Post Office and Post Roads (Twenty-first through Twenty-fourth Congresses), Committee on Judiciary (Twenty-fourth and Twenty-fifth Congresses); appointed Attorney General of the United States by President Martin Van Buren in July 1838; resigned in December 1839, having been elected as a Democrat to the United States Senate on November 19, 1839, to fill the vacancy in the term commencing March 4, 1839, caused by the resignation of Ephraim Foster; the question of his eligibility to election as Senator while holding the office of Attorney General of the United States having been raised, he resigned from the Senate on December 14, 1839, and was reelected the same day, serving from December 14, 1839, until his death in Nashville, Tenn., December 19, 1840; chairman, Committee on Revolutionary Claims (Twenty-sixth Congress); interment in Mount Olivet Cemetery. Dictionary of American Biography; Ewing, Frances Howard. The Senatorial Career of the Hon. Felix Grundy. Tennessee Historical Magazine 2 (October 1931): 3-27, 2 (January 1932): 111-35, 2 (April 1932): 220-24, 2 (July 1932): 270-91; Parks, Joseph. Felix Grundy: Champion of Democracy. Baton Rouge: Louisiana State University Press, 1940.